Media and Contents: 285mm X 185mm in a portrait format with card covers and 48 pages, 39 reasonable quality black and white photos plus 7 pages of artwork which include profiles and action paintings. Advantages: Covers all ships from the beginning (during World War I) to the end of the Second World War including those built during but not completed until after and gorgeous artwork in colour. Conclusion: A very interesting book. It's just a pity there are no modern models of any of these ships but we can live in hope. At the same time as the Admiralty was designing and building the Dreadnaught, which revolutionised capital ship design, they were also playing around with both aircraft and submarines. HMS Furious, being built as a Battlecruiser, was altered to have a flight deck fitted forward of the superstructure, replacing the forward turret and later a landing on deck was added aft. It was decided that the superstructure caused too much turbulence and it too was removed and replaced with a single full-length flight deck. Meanwhile, several other ships were under construction on similar lines. HMS Hermes was the first purpose designed and built aircraft carrier and HMS Argus was based on a merchant ship hull and although both were small, they proved the theory worked. Other ships followed. Furious' two half sisters, Courageous and Glorious were also converted and HMS Eagle was based on a Battleship hull designed for Chile and taken over by the Royal Navy. The last built before the Second World War was HMS Ark Royal which set new design parameters for future carriers but also held some design flaws which resulted in her loss when torpedoed in the Med. There are good clear black and white photographs of all ships mentioned so far plus pictures of the aircraft they carried and two very nice paintings, one a profile of HMS Hermes, an angle shot of HMS Furious and a profile of a Fairy Fulmar two-seat fighter as carried mid war and the other an action shot of HMS Ark Royal with a heavy list after being torpedoed. The next carriers designed and built were a big improvement, learning from both Ark Royals faults and advantages and the first to be built during the war, the Illustrious Class were known as armoured fleet carriers because of their armoured flight deck which caused them to have only one hanger deck, as opposed to Ark Royals two, and could only carry 36 aircraft as opposed to Ark Royals 60. There were three ships, Illustrious, Formidable and Victorious. A fourth, HMS Indomitable, had some internal modifications that allowed 45 aircraft to be carried. A further two were altered enough to be considered a separate class. These two, Implacable and Indefatigable, were lengthened slightly, were faster (32 knots as apposed to 30.5 knots) and reverted to the two hanger decks which allowed the carriage of 60 aircraft. Again, there are many period B&W photos of these ships plus artwork of Illustrious showing much of its internal workings and a cross section of Victorious midway along the island. These wartime Armoured Fleet Carriers proved their worth with many being bombed, torpedoed and even hit by Kamikaze aircraft but none were lost. Not so their earlier unprotected compatriots with Hermes, Eagle, Courageous, Glorious and Ark Royal succumbing to enemy action leaving the Royal Navy still short of carriers. Enter the Light Fleet Carriers of the Colossus and Majestic classes. Based on merchant ship hulls, smaller, slower and un-armoured compared to the Illustrious and Implacable classes but able to be built faster and cheaper yet still protect the fleet, only four of the Colossus class were commissioned before war’s end. 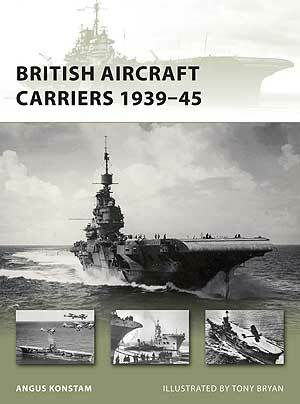 With sections on Operations and Service History you get again many period photos of the ships, aircraft and many on-deck activities plus artwork showing a profile of Ark Royal and a three-quarter view of Glorious plus an insert profile of a Fairey Swordfish, an action shot of Formidable at the battle of Cape Matapan plus a profile of Indefatigable and quarter shot of Victorious. Many years ago, Heller produced a 1/400th scale Colossus class, Revell did an Ark Royal in an odd scale, I think 1/720th, and one of the Japanese ship model companies, Pitt Road or Skywave, did some Armoured Fleet Carriers, none of which I've seen accept the Revell kit which was not real good and I'm told the others are no better.